Check out this piece I did for International Living on antiques in Tokyo: what is available and where to find them. Happy hunting! Japan is an antique collector’s paradise. From unique wedding gifts to snazzy souvenirs, the antique shops and local markets in central Tokyo have it all – and they are surprisingly affordable. Most of the items sold are in excellent condition, even in the flea market. These sought-after, miniature Japanese statues originally served as buttons and toggles. Before the days of backpacks and jean pockets, netsuke were used to secure purses, tobacco pouches and fans as they were tucked into kimono belts or sleeves. Netsuke were first produced in the Edo period during the 17th century and were used daily until the first half of the 20th century. Netsuke are considered to be tiny works of art. They were fashioned by artisans into shapes such as tigers, gods, fruit, masks, mermaids, monkeys and the images of loved ones. The value of netsuke depends on its rarity, material and, of course, the quality of craftsmanship. Common material includes ivory, porcelain, hardwoods and lacquerware. Mammoth ivory was popular in more recently produced netsuke. Occasionally you will find these intricate little sculptures made of agate, walnut, black coral and walrus tusk. Used as indication of social class and wealth, the netsuke of the affluent could be a solid gold miniature scroll; an ivory rabbit with ruby eyes; a lacquerware and emerald dragon. A typical netsuke varies from size of a sugar cube to a large button. They may be signed by the artist, bear their owners name or have no markings at all. Modern reproductions abound: they are often made in China from plastic or bone and have a mass-produced look. Original netsuke can cost anything from $50 to several thousand dollars. Beautiful pieces can be found for $100 at Oedo Antique Market which is an enormous affair taking place every 1st and 3rd Sunday in a different location in central Tokyo. A schedule and map of the next market day can be found in English on their website. Serious collectors and art lovers who are willing to spend more will want to go to Tokyo’s netsuke specialist at Sagemonoya Netsuke Gallery in Yotsuya. The staff speak several languages, have extensive information on their products and are open Wednesday to Saturday, 1.30pm to 6pm or by appointment. A new kimono may set you back $1500, but the good news is that vintage pieces are sold for a fraction of the price, you can even find dirt cheap kimono. Traditional Japanese silk kimono are not only purchased to be worn: they can be used as wall hangings, table runners, pajamas and are easily remade as cushion covers. Finding genuine vintage kimono in Tokyo is simple. As there are so many original pieces, there is no market for fakes in Japan. There are always kimono for sale at local markets and you can be sure that they are the real deal. Most kimono are made from silk with designs painted on the fabric. Kimono gowns can be quite plain and worn with and ornate obi (wide belt) or very ornate, often decorated with seasonal designs such as spring blossoms, autumn leaves or a snowy landscape. Obi belts are often sold at a slightly higher price to an ordinary kimono: they are handmade, and the production of such cloth is difficult. The obi are either made of silk brocade, woven or decorated using the ancient art of shibori tie-dyeing. Women’s obi are perfect as a wall hanging or table runner as they are about 30cm wide and 3 or 4 metres long. Most second-hand kimono are post war, some of the 70’s kimono are even made from polyester with a psychedelic floral print. Fortunately, most of the kimono that you will find in Tokyo are in the traditional style. Obi patterns are often symbolic: a river for long life, cranes for good luck, red for happiness. Plain black kimono are used for funeral and very formal events. Flea markets such as the Oedo Antique Markets and the Hanazono Shrine Markets (see below) have a huge selection of obi, kimono and haori jackets, a waist-length coat that’s easily worn with jeans. 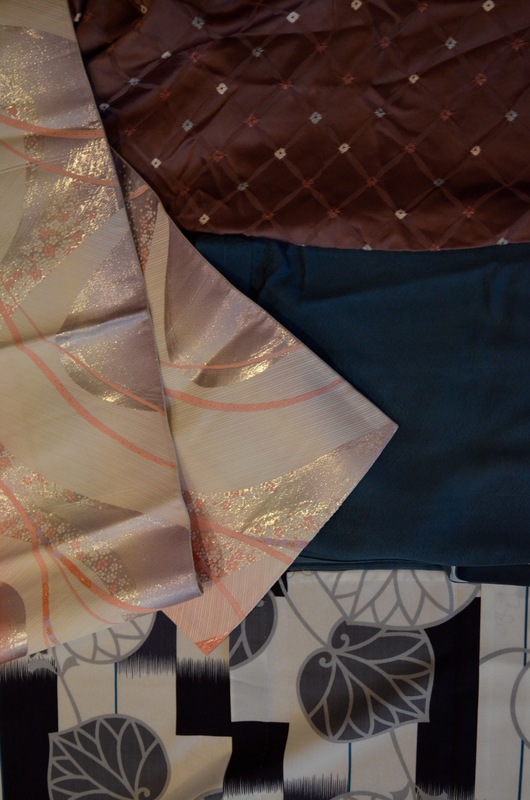 Kimono and haori are usually $15 – 40 each, obi can be $20 – $70 each, depending on the craftsmanship. As formal kimono are were never worn daily, the items at these markets are in remarkably good condition, but check for stains. If you are looking for something special, the vintage kimono and obi for sale in Oriental Bazaar, the famous souvenir shop on Omote Sando Street are particularly beautiful. Intricate wedding obi can be found here and the staff will explain the symbolism and age of the kimono in good English. Oriental Bazaar also sell rails to hang obi and kimono for display as artwork. The price of such obi are $40 – $200. The variety of teapots, plates, bowls and vases in Japan is endless. Every flea market and local junk shop is crammed with antique pottery and traditional porcelain, some of them still in their original boxes. One of my favourite Japanese household items to buy at the antique markets are the simple Japanese tsukemonoki : ceramic pickle jars with a heavy wooden lid. Imari porcelain is Japan’s most exquisite chinaware, sought after around the globe since its first production in the 17th century. Imari ware can be in the cobalt blue-and-white style of Ming dynasty or red, green and gold. 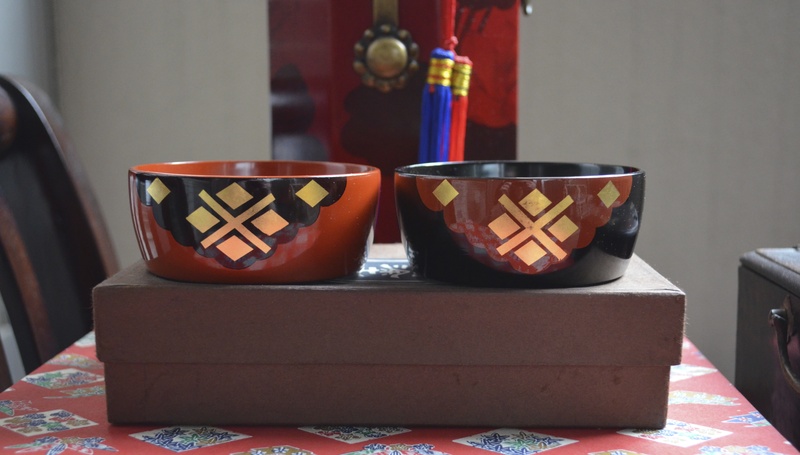 Intricate designs and the use of pure gold make Imari pieces exclusive and pricey. Hand-made earthenware such as Raku ware and Shigaraki ware are still commonly produced and are made in natural tones with simple designs. 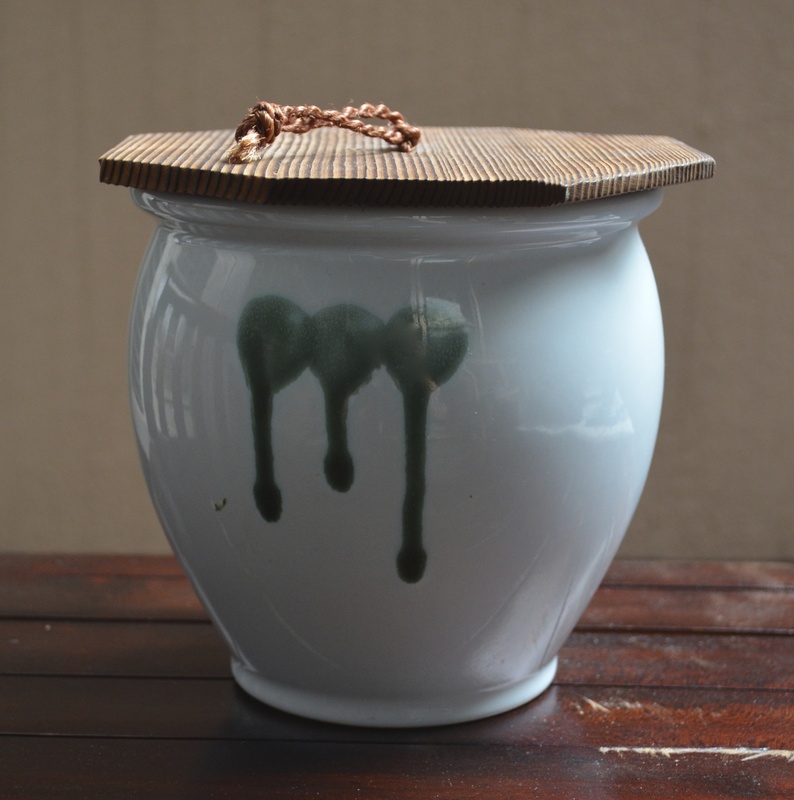 Vases, tiles, tea cups, pickle pots, bowls, and charcoal braziers are available in distinctively Japanese styles. They can be glazed or unglazed, occasionally with a splash of bright colour. Hanazono Shrine (5-17-3 Shinjuku, a few minutes walk from Shinjuku Station) holds an antique market every Sunday until sunset which is particularly dedicated to pottery. Some very old and rare pieces can be found at low prices if you are prepared to hunt for them. Antique Mall Ginza is an entire mall of antique stores. Every type of Asian antique is for sale here and there are countless stores devoted to Japanese ceramics of all varieties. Open 11am – 7pm, closed on Wednesdays.